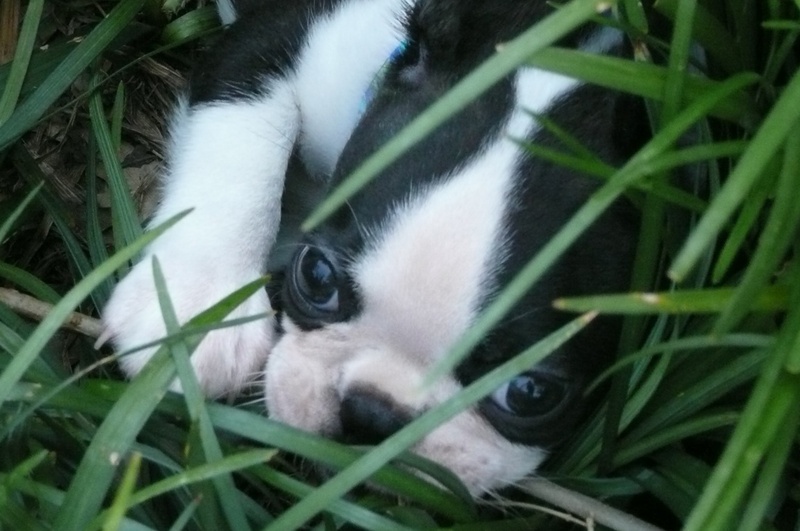 Give your active puppy a great start to his nutrition. Grain-free puppy formula with real salmon and smoked salmon provides a superior taste sensation, highly digestible energy, and natural antioxidants to support a healthy immune system and overall health in growing puppies. This grain-free formula provides digestible energy and excellent nutrition that growing puppies need. Made with a blend of fish protein sources, this hearty formula offers a taste sensation like no other. Fruits and vegetables, like sweet potatoes, blueberries, raspberries, and tomatoes, deliver natural antioxidants to help support a healthy lifestyle. Each tasty bite of this crunchy dry dog food gives your puppy real fish protein for a healthy body; Omega-6 and Omega-3 fatty acids for healthy skin and a shiny coat; fiber and beneficial digestive bacteria for digestive support; and chelated minerals for optimal mineral nutrition. 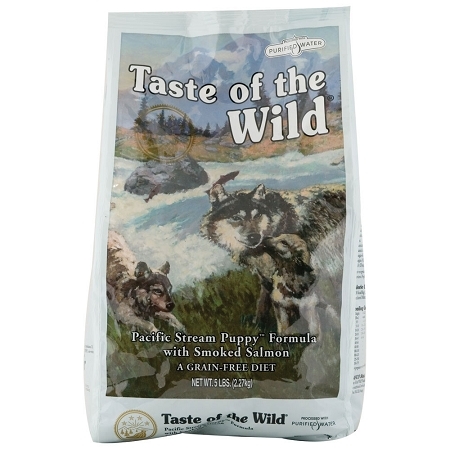 Taste of the Wild Pacific Stream Puppy Formula with Smoked Salmon contains no corn or soy, and it's a good choice for puppies with food sensitivities. For growing puppies to 1 year of age. Contains 27% protein, 15% fat, and 5% fiber. No Grain - Natural grain-free formula with vitamins and minerals offers your pet nutrition for health and vitality. Smoked & Fresh Salmon - Rich in omega fatty acids, these ingredients offer highly digestible protein to help your dog maintain the sleek condition of good health. Protein Blend For Optimal Amino Acid Profile - Amino acids are the building blocks for a healthy body, a healthy immune system and healthy skin and a shiny coat. Digestive Support System - Dried chicory root is a natural fiber that helps support a healthy digestive system. Antioxidants - Fruits and vegetables provide natural antioxidants and guaranteed levels of zinc, vitamin E and selenium help support optimal cellular health. Omega Fatty Acid Blend - Omega-6 and Omega-3 fatty acids work to together to help maintain healthy skin and a shiny coat. Sweet Potatoes - Rich in dietary fiber, vitamins A and C, iron, calcium and beta carotene, this is one ideal complex carbohydrate source that provides all day energy. Blueberries & Raspberries - Berries are packed with powerful antioxidants to help keep the body healthy as the days go by. Tomatoes & Tomato Pomace - Natural sources of antioxidants and vegetable fiber to help support overall good health. Chelated Minerals - During the digestion process, minerals are attached to proteins for absorption from the digestive tract. Salmon, Ocean Fish Meal, Sweet Potatoes, Potatoes, Peas, Pea Protein, Canola Oil, Tomato Pomace, Smoked Salmon, Salmon Meal, Natural Flavor, Salmon Oil (a source of DHA), Salt, Choline Chloride, Mixed Tocopherols (a preservative), Dried Chicory Root, Yucca Schidigera Extract, Tomatoes, Blueberries, Raspberries, Dried Enterococcus faecium Fermentation Product, Dried Lactobacillus acidophilus Fermentation Product, Dried Lactobacillus casei Fermentation Product, Dried Lactobacillus plantarum Fermentation Product, Dried Trichoderma longibrachiatum Fermentation Extract, Vitamin E Supplement, Iron Proteinate, Zinc Proteinate, Copper Proteinate, Ferrous Sulfate, Zinc Sulfate, Copper Sulfate, Potassium Iodide, Thiamine Mononitrate (Vitamin B1), Manganese Proteinate, Manganous Oxide, Ascorbic Acid, Vitamin A Supplement, Biotin, Niacin, Calcium Pantothenate, Manganese Sulfate, Sodium Selenite, Pyridoxine Hydrochloride (Vitamin B6), Vitamin B12 Supplement, Riboflavin (Vitamin B2), Vitamin D Supplement, Folic Acid.